Long-standing Shantallow GP Dr. Anne McCloskey retired from practice on Friday and will now throw all her energies into contesting the upcoming Council elections for Aontú, Ireland’s newest political party. Dr. McCloskey bade farewell to colleagues at the Shantallow Health Centre where she had worked for 28 years. 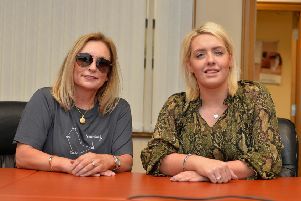 On the same day she officially handed in her nomination paper prior to standing in the elections to the Ballyarnett District Electoral Area (DEA) of Derry City and Strabane District Council on May 2. Like fellow members of the Cherish All The Children Equally Human Rights Association, Anne and Francie Brolly, Dr. McCloskey has now joined Peadar Tóibín’s pro-life all-island republican party Aontú. “I live, and raised up my family in the Waterside, a few streets from where I was born. “However, having worked as a GP in Shantallow Health Centre in the heart of the Ballyarnett Electoral Ward for 28 years, I feel that I understand the needs of this district. I have been involved in community activism throughout my life, and believe that local experience should steer decisions affecting the people,” she declared.